Our son Emerson is 4 years old, and he has Down syndrome. Because of having DS, Emerson has low muscle tone and has been delayed hitting most of his milestones. To help Emerson with his development we decided to give hippotherapy a try, and he began doing sessions at Freedom Hills in July 2013. Before beginning at Freedom Hills, Emerson was walking with assistance, and it would take a lot of encouragement on our part to get him to try walking independently. After only 4 hippotherapy sessions, Emerson started walking independently, and now he’s just like any other little boy – we have to run to keep up with him! Hippotherapy at Freedom Hills has clearly helped Emerson to refine his gross motor skills and has increased his independence. We also realized that shortly after beginning hippotherapy, his vocabulary started increasing (both verbal and sign language), as well as his fine motor skills. At only 2 years old, and after a total of 6 hippotherapy sessions, Emerson had mastered the skills of eating with utensils and drinking from an open cup. 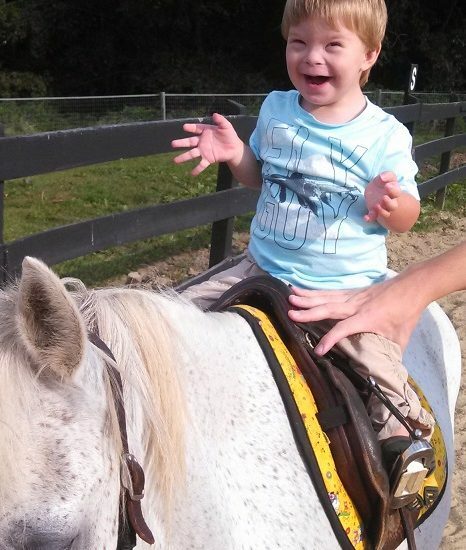 Emerson’s day care teachers and his physical, occupational and speech therapists all noticed the spike in his development after the first few months in hippotherapy, too – from gross motor, to fine motor, to speech skills! Now Emerson has been riding for almost 2 years, and his development has consistently evolved since that initial spike we saw after just a few sessions. Emerson knows all of his letters and numbers 0 through 10; and he is working on more advanced fine motor skills such as cutting food with utensils and using buttons. He has been jumping in place for about a year, but recently added jumping off of raised surfaces to his skill set (he never misses the opportunity to jump off of a curb or into a puddle)! Emerson’s development has come along so well that he will be in a 4-year old Pre-K class with his peers (most will not have developmental delays) in the Fall! Although it’s possible that Emerson was always set to develop at this pace, we’re confident that his involvement in the hippotherapy program at Freedom Hills has accelerated Emerson’s development. We have seen first-hand the importance of early intervention therapies for children with developmental delays, and the hippotherapy program at Freedom Hills has been a different, fun way to challenge Emerson and to foster his development. We started seeing physical evidence of the difference the program is making in our son’s life immediately, and we are so grateful we are able to have him in it. We truly wish that hippotherapy was included as a normal piece of the state-funded therapy that is available for children with DS and other developmental delays, so that this beneficial therapy could be available for everyone in need.